Iowa Memorial Granite Company sells, designs, builds and delivers granite memorial benches for graves, memorial garden benches, gravestone benches, monubenches, bench headstones, memorial seats, graveside benches, cremation benches and cemetery bench monuments. Granite memorial benches are pictured below. 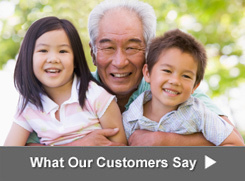 If you have a question about ordering a granite memorial bench, click on one of the 3 links below to get a question answered, request an estimate or request that a brochure be mailed to you. Click on the image to see a larger picture. We manufacture memorial benches from granite for families and individuals that want to commemorate someone who has passed away. They are usually delivered to cemteries and other public locations although some people set their memorial bench in a garden at their house. 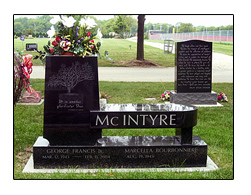 Granite memorial benches from the Iowa Memorial Granite Company offer a beautiful addition to a cemetery gravesite. 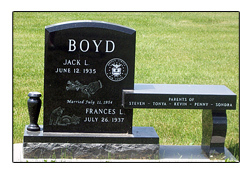 Pictured in our "Granite Memorial Benches" gallery is a beautiful granite memorial bench we designed to pay tribute to, and memorialize Frances and Jack (Jackie) Boyd. The black granite memorial bench for the Boyd Family shows intricate etchings of 2 cats and the United States Air Force insignia on the tablet. 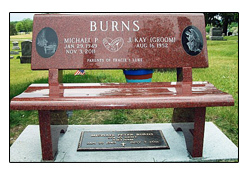 We are happy to deliver a bench to the Iowa or Illinois cemetery specified by our customer. Memorial granite benches are available in a wide variety of designs, shapes, styles and colors including polished or rough finishes. Granite memorial benches designed and built in our Muscatine, Iowa workshop are everlasting resting places that offer peaceful sanctuary to family members and friends who are either mourning or honoring the memory of a close friend or beloved family member. The granite memorial benches we hand carve are often used to designate a family plot in an Iowa or Illinois cemetery. 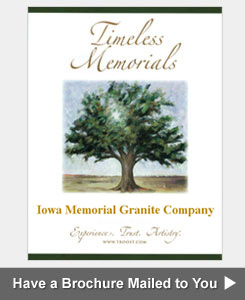 Granite bench memorials from the Iowa Memorial Granite Company are affordably priced. 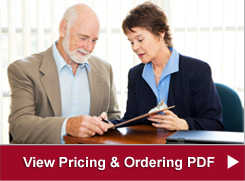 Our prices may or may not include cemetery setting and installation fees for memorial benches. Cremation memorial benches are used as an alternative to a traditional monument and can include a niche for cremated remains. We design cremation memorial benches for families throughout Iowa and Western Illinois. We design, sell and manufacture granite cemetery benches (gravestone benches, monubenches, bench headstones, graveside benches, cemetery stone benches, cremation benches and cemetery bench monuments) for families who live in the Quad Cities metropolitan area (Davenport, Bettendorf and Scott County in Iowa); and Moline, East Moline, Rock Island and Rock Island County in Illinois and Cedar, Clinton, Jackson, Louisa and Muscatine counties in Iowa; and Carroll, Henry, Mercer and Whiteside counties in Illinois. Iowa Memorial Granite Company offers a complete selection of granite benches with prices starting at just $1290. Granite memorial benches are a common form of gravestone used to memorialize a loved one, a couple or companions or various extended family members. Graveside benches are an option for Iowa or Illinois families that don't want to purchase a common flat grave marker, upright cemetery monument or raised granite headstone. Iowa Memorial Granite Company usually crafts personalized memorial benches for cemeteries, cremation memorial benches, memorial garden benches and memorial benches for parks from a very hard stone such as granite. We offer pedestal cremation benches, park bench style memorial benches, granite memorial benches with beautiful etchings and beveled edges, heart shaped cremation benches and granite benches with detailed bas relief sculptures. We can design and sculpt memorial benches with guardian angels, saints and other religious figures into cremation benches. We will be honored to design an exquisite cremation niche bench for your loved one or family which can securely enclose the cremation urn as an timeless memorial. We are experts at hand carving, sculpting and engraving inscriptions, epitaphs, quotes, sayings, family names, birth dates and death dates on granite memorial benches. Our office managers, Randall & Polly Geurink, who have 20 years of experience in the monument industry, will be pleased to help you decide on a proper inscription, etching, epitaph, saying, quote or short text to honor, memorialize, recognize and pay respects to the deceased person. Also included in the inscription on the memorial bench will be birth and death dates and the person (s) name (s). We can also inscribe personal family messages and prayers and etch funerary artwork on a granite memorial bench. 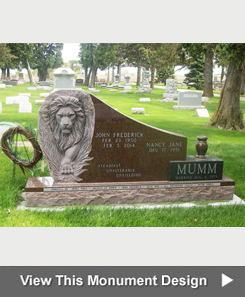 Click here to view the colors of granite available for monuments, markers and memorial benches. Once we finish crafting the memorial bench, we can deliver it to any cemetery, memorial garden or park in southeastern Iowa or western Illinois. The granite memorial bench, pictured below, that we designed for the Kulas Family is a good example of how the Iowa Memorial Granite Company inscribed the names for Robert L. and Mary K. in the granite and attached a picture portrait of the couple to the memorial bench. The Iowa Memorial Granite Company also sells granite memorial benches that are used to complement the family, community and private mausoleums we build. We do not build concrete memorial benches. To learn more about memorial benches visit Wikipedia. If you are considering purchasing a memorial garden bench, memorial park bench or granite memorial bench for a cemetery garden or scattering garden, call 563-263-5484 to speak with Randy or Polly Geurink about the cost of a granite memorial bench. One of our office managers can walk you through the basic steps required to choosing just the right granite memorial bench. Because of our craftsmanship and reputation, we have become one of the leading suppliers and manufacturers of granite memorial benches in the Quad Cities metropolitan area.